Need a strong hero or villain character for your game? Mafia Men - Yakuza Boss is the first installment of our Underworld Characters serials. There are two versions of the character 1) Character without jacket (10K tris) has 1 PBR material with 2 texture sets (4K) metal roughness and unity standard metallic. 2) Character with jacket (14K tris) has 2 PBR materials with 2 texture sets (4K) metal roughness and unity standard metallic. Texture set metal roughness contains maps BaseColor, Normal, Metallic, Roughness. Texture set unity standard metallic contains maps AlbedoTransparency, Normal, MetallicSmoothness. 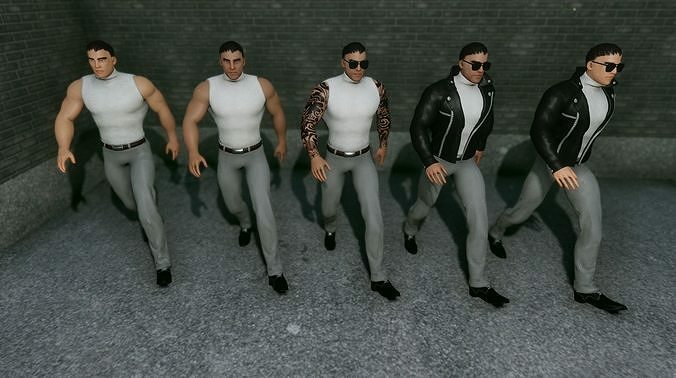 Both versions of the character are rigged with Mixamo which means you can apply any humanoid animation packs from the asset store to this character. This pack itself contains no animation. Props shown in the promo pictures like sunglasses (500 tris) and the show floor (25K tris) are included. Note: to re-create the same visual appearance shown in the promo video, one needs to set the project to use linear color space and Unity post processing stack (ver. above 2.0) and metal roughness texture set. Reviews with feedback are highly appreciate.